Another Well-Loved Cartoon Finally Has A Release On The Way! Hey Moonies! This once again is another completely off topic post, but The Me and I decided to post it because we have a lot of things in common with this fan community. MTV used to air cartoons. Good ones too. Who here remembers a show called Daria? The show ran for 5 seasons, and has a special place in the heart of all of Moon Chase’s staff members. This was a cartoon that really had teenage life down to a T. Sadly, this gem of a cartoon barely had any DVD or VHS releases, leaving many fans to turn to P2P to get their episodes. And back then, the technology just wasn’t there. The Me and I have quite the collection of grainy, uncut, episodes in wonderful .rm format. Yes, there are better ones floating around, but unfortunately those were captured from reruns on Nickelodeon, where the show was edited. If you thought Sailor Moon’s edits were terrible, some of the things that were cut out of Daria were just as ridiculous, if not more (I mean really, Nickelodeon? What was the reason for cutting out Sick, Sad, World?). One site continued to remain active to keep up with the fandom – Outpost Daria. We really love this site as it is the ultimate resource for anyone who is a fan of this cartoon! Since 2002, there have been a few efforts by fans to get the show released in entirety on DVD. In fact, the show was so heavily requested that for quite a while now, the show was #3 on TVshowsonDVD’s list of “Most Requested Unreleased Shows” . The Me and I have even on occasion lent our support wherever we could over the years. I remember 2-3 years ago there were some Daria shirts kicking around at a Hot Topic and I found one in a really obscure town. Needless to say, every time I wore the shirt everyone was asking where I got it and we’d reminisce about the show. We did our part wherever we could! Hours ago, we just received the best news from TVshowsonDVD – a blogger was lucky enough to get an advance copy of another release of an old MTV show, The State. And sure enough, there was a commercial about Daria being released in 2010. We were so excited to hear this news that we just had to share this with you – Daria fans have been waiting 7 years for a release like this, and we hope that this inspires all of you Sailor Moon fans to keep going even though sometimes it may seem like a lost cause! Now there are a couple things we haven’t read a lot of details into – the first is, as of this writing we cannot confirm all of the original music cues will be included. Since Daria was on MTV, and MTV pretty much lived to play music videos, they had the rights to all the music that was played on the show anyway. However, times are different, and we had heard that this was the #1 reason why the show wasn’t released for years. The second thing is, we’re reading on forums that the show probably won’t make it out till 3rd or 4th quarter 2010. We’d love for it to be sooner, but what’s another year or so? At least the fans are getting a release! All in all, all of us on staff are really happy and excited for this release! We hope this inspires fans who haven’t had a lot of faith in Sailor Moon lately to join our campaign! And we’d like to take this time to congratulate the staff of DVDaria for all their years of hard work – we’re just starting to scratch the surface with the big names involved with Sailor Moon and your persistence in getting a release was really formidable. We hope that this release is everything that you hoped for! In celebration, we’ve decided to share a few links to our favorite episodes. On February 3, 1959, a plane crash claimed the lives of three of the big names in music of the day: Ritchie Valens, The Big Bopper, and Buddy Holly. This was later dubbed “The Day The Music Died.” Today, we lost two legendary icons, Farrah Fawcett and Michael Jackson. The magnitude of these two icons must be as large, if not larger, as those three artists in their day. I wonder, if some time in the future, this day will have a name too. The entire staff of Moon Chase sends out condolences to the family and friends of Farrah and Michael. 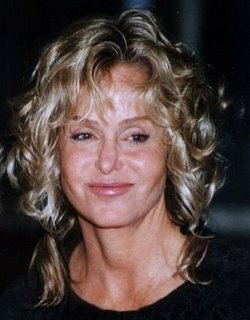 I wasn’t alive when Farrah Fawcett was an Angel. I had heard stories of her though, and came to know her as one of the stars my Mom used to watch growing up in the 70s. She was the epitome of beauty, she had the hair every woman wishes they had, and she had a major impact on the world as we know it with her personality, and her time on Charlie’s Angels. Over the last year or so, she was one of the celebrities that popped in and out of the tabloids, and throughout the bits and pieces of the truth that came out about her cancer battle, I came to appreciate her much more. She had gone to great lengths to fight her cancer, seeking treatment in Germany when (from what I had read) doctors just weren’t willing to try or consider other therapies that were deemed too experimental. I watched her documentary a few times when it aired last month. Here was a woman, afflicted with one of the worst diseases a person could ever have, going to great lengths to beat this, and still at the end of the day having the energy to fight for her rights to privacy, and still making the time to find the good in life. And even though the cancer was tearing her family apart, she still managed to keep them together by keeping everyone laughing and smiling through the ups and downs of her battle. I finally had a reason to look up to her, but not for the same reason as the generation before me. I had read in recent days that her health had taken a severe turn for the worse, and I hoped that she would be relieved of the disease that had caused her so much pain, in one way or another. She never stopped fighting. In her death, she had dealt the cancer the ultimate blow. She wasn’t going to let it hurt her anymore, despite her attempts to hurt the cancer with treatments, of which some worked, and some didn’t. And that’s how I will remember Farrah. She is best known for playing a brave, strong, and blonde superhero, much like the icon this site is dedicated to, but I will know and remember her for her bravery and strength she showed in her last years on Earth. Rest in Peace, Farrah. This afternoon, I had finished watching the last aired episode of Flashpoint on my DTVR. I was ready to get up off of the couch and celebrate, because writing 28 pages of TV episode summaries within a span of four days, was not a joke. I thought one day, when Sailor Moon had achieved the success that it deserved and had settled into the market, there would be no more stories to tell on Moon Chase. Slowly, to the fans who were still interested, I would share some of the crazy stories from behind the scenes of the things the staff and I did to bring content to the site. This, was one of those anecdotes to share when that time came. I had stopped the episode, and was waiting for my box to delete it, when in the corner of my screen, CNN was playing, and I hear Michael Jackson is in a deep coma. As the news was recapping the details, I had wondered if this was the result of some sort of last minute plastic surgery gone wrong. I was weary of what his upcoming shows were going to be like, and I had friends who were going to attend his concerts in September. I knew of all the rumors about his face falling apart, and figured it must have been surgery gone wrong. After the episode deleted, I got out of my list screen and watched the news. Then as more details came out, it had seemed that this really did come out of the blue. I was a child of the 80s, and I probably was a fan of his music back then, but now, not so much. Over the last few years the news reports had reported so many bizarre things that I pretty much thought that if his strange clothes and personal anecdotes make him happy, then who are we to judge? I admit, I was creeped out with the court case not too long ago, and it’s hard not to have anything to say when it came up in conversation. 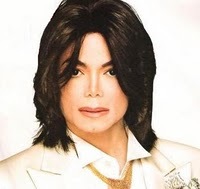 But, that’s all in the past now… what anyone may ever say about him, he was talented, and motivated to be a star since he was a child, and he worked hard to bring happiness to the whole world over in his time. And that is the memory that will last with our generation. People of Iran, You Have Moon Chase’s Support. We here at Moon Chase have a no-politics rule, however we’re going to break it for this post only. We’ll break down the current crisis for you in a few short sentences. There was an election. Mahmoud Ahmadinejad, who has led Iran since 2005, was declared the winner by 62% of the votes. However, the vast majority of posts we’re reading allege that these aren’t true, that corrupt personnel in the government falsified the results to keep Ahmadinejad in power, that many, millions of votes were simply not counted, and that it is impossible to have counted 39 million hand ballots in a matter of one day. Many Iranians are of the sentiment that Mir-Hossein Mousavi is a more progressive choice towards moving Iran in a much different direction, and that their votes for him were withheld. We can only hope that voters in Iran will one day get a fair and accurate count of their votes. Foreign media outlets have been choked of covering any protests that are not in favor of Ahmadinejad, and as you are reading this, members of Iran’s armies are going after protesters who simply want a re-election or a recount. Iranians are being brave and playing tricks with proxies on Twitter to get news, and their voices heard, to the world. The best thing you can do right now, is read this article from boing-boing about how to protect Iranians and learn which tweets to read from the cyberwar which has erupted in light of all of this. If you find a proxy or a hashtag that hasn’t been monitored, don’t share it online in a public place. Send an email, call a friend, etc. This is the safest way to keep them protected. Pass on anything breaking to your local news outlet. While many are saying to change your Twitter account settings to Iranian ones, we don’t recommend this. While it hides and protects Iranian tweeters, there is also a risk involved that all Iran twitter accounts may be shut down under a threat from the Iranian government to the offices of Twitter. Our Twitter icon and background will be turning green until this is resolved. If you have a Twitter account, please go green in support of Iran. We’ll also tell you about an interesting animated film some of us on staff have seen. At Moon Chase, we believe our readers should try to expand their animated horizons beyond Japan. There’s a large world out there in foreign animation. Persepolis, a film by Marjane Satrapi, tells the story of similar events from the 70s and 80s in Iran through the eyes of a young girl. This film is autobiographical and is based on Marjane’s own experiences (which were told through a comic of the same name). The film was not positively received by the Iranian government over the fact that it did not “glamorize” the effects of the revolutions and political changes which took place. The film has won several awards and honors worldwide. Marjane has also come out in support and with more figures declaring Mousavi the winner. For those of our readers who want to know more about Iran’s turmoils have shaped the country today, we suggest watching it. In your own small way, by supporting this movie, you’re showing Iran that you can’t just look at the picture they paint of their own country. Future Anime Not Even Worth Half Of Its Hefty Pricetag! This afternoon, I finally caved and picked up the latest issue of Future Anime from my local convenience store. This is only the magazine’s second issue, the first one was released around a year ago. I never got to read that one, but I had been reading that there were plans to release more issues of this magazine if the demand was high. 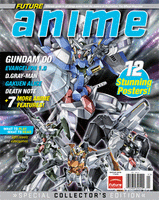 This is one of only two anime magazines on the market right now (the other being the bi-monthly Otaku USA). So, I purchased the magazine, when to my surprise at the till I was greeted with an astronomical price of just over 13 dollars. I couldn’t believe it, especially since the magazine was not terribly thick, but I bought it anyway. My mistake for not checking the price tag! 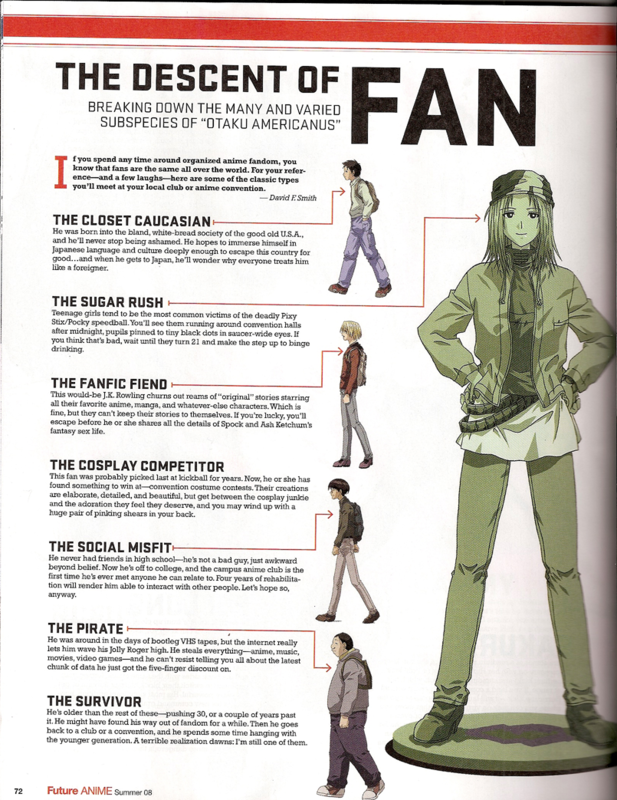 ☽ 13 Anime descriptions with shortish reviews, in almost the exact visual format as the anime reviews in NewType USA. They all included offbeat titles, series information in a tiny box, and the article text set off at an angle. Of course, these were set against a large picture from the anime in question, and the text barely covered half a page. ☽ 1 Two-page introduction to hot manga titles and titles which should be picked up. This was also done on a “lovely” hot mustard colored background. ☽ 12 two-page pull-out posters from: Darker than Black, Ouran, Prinny, Cross Edge, Voltron Fleet of Doom, Nighthead Genesis , Maria Watches over Us , Gakuen Alice, Princess Resurrection, Clannad, Freedom, and Code Geass. These posters weren’t particularly glamorous with the images that were used. We can see some otaku sticking these posters on their wall, but how are a bunch of posters really considered a magazine bonus? What are we, like 8? ☽ 7 Video Game Reviews. 6 of them were crammed in a 6-page spread, and the 7th was a review of the new fighters from Street Fighter IV. 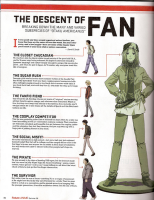 ☽ 1 Editorial about the “Subspecies” of American anime fans. I had to scan this for this article. Even though it tried to be humorous, it just didn’t do it for me. Maybe it was because I was so frustrated with everything in this magazine up until this point. Click the image for full size. The writing in this magazine was so-so. It didn’t keep me engaged and excited as reading NewType or Anime Insider once did. There were a couple mediocre standouts in this magazine, the first was a review of Full Metal Alchemist written from the perspective of a writer who ran a two day marathon watching all the episodes. The second was an article on the live action Death Note movie with a small inset about other live action films picked up by Viz. All the video game reviews were lukewarm at best. The manga reviews were pretty generic. What would have made this issue much better would have been featuring other aspects of anime culture like perhaps a few interviews with some company reps, crew, or voice actors, or some actual news articles about anime. I would have loved to have read another perspective on the current downturn in the anime industry. And some cosplayers or anecdotes from Japan would have added a little more life to this magazine. Heck, it’s con season. Would it have hurt to have featured some coverage from one con? All in all? It was not worth the 13 bucks. 5, maybe. It doesn’t matter that this is a yearly publication, so it’s seemingly alright if it costs that much. If Future PLC is going to charge that much for a magazine, it should include that much worth in quality. Canadians, Please Support Local TV! This article is just for our Canadian readers. 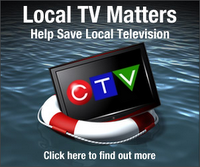 By now you’ve probably seen one of the several commercials CTV is running about saving local TV stations, and tomorrow is a national day of action. We here at Moon Chase encourage you to get involved! Still a little confused about what’s going on? We’re going to break it down for you. For at least a decade, local TV stations such as CTV, Global, A-Channel, NTV, and CBC have been in trouble. Cable and Satellite TV providers in Canada transmit local TV signals, however none of the sometimes astronomical fees you pay each month on your bill go back to your local station. These stations have largely had to rely on revenues from advertisers on the air and on the internet, however it is just not enough and every local TV station is facing a crisis as we speak. Twice in the last few months these stations have all appealed to the CRTC asking for Cable and Satellite TV providers to pay them a fee-for-carriage (essentially the companies have to pay the stations for retransmitting their signals and programming), but unfortunately the CRTC has denied their requests. Currently in the United States, there is a fee-for-carriage system and cable providers have the right to drop a TV station if they cannot come to an agreement. CTV is also calling for a review of how cable and satellite companies bundle and bill customers for channels in an effort to protect consumers. CTV has stated that they do not want the customers to pay, the want the companies to pay. On a side note , think about your cable bill. You pay a rental fee each month for a digital box just to access regular cable, and it’s likely that you have a few theme packages added to your extended cable so you can enjoy many of the current TV and movie hits (Movie Central, The Movie Network, Super Channel, and The CW all come to mind). And most providers in Canada charge you extra per month if you want a box that has a personal video recorder included. Some cable companies in Canada don’t have the technology in place where one box can power all the TVs in your house. So if you have two televisions, you need two boxes, etc. You would think that the cable company just gets revenue from your box rentals, and the rest goes to the channels you pay for. However, that is not the case with local TV stations. Only specialty channels get anything back from your cable bill. Tomorrow, CTV and A-Channel stations across the country will be having an open house. There will be teams of tour guides showing the public how local TV is made, and they will also show you all the departments in the station. The stations will also have old clips, milestones, and memorabilia from the past on display. There will also likely be petitions to sign, and contacts handed out for your local MP and other noteworthy people in Parliament to contact. Furthermore, CTV Newsnet will be airing a 2 hour live special starting at 1PM Eastern with footage from the day’s events at all 16 CTV and A-Channel stations having open houses. For more information, visit CTV’s campaign site, and choose your local station from the map. As of this writing, CTV is the only station which is rallying up public interest of this issue. I’m sure at one time or another we have all needed CTV’s help in our communities to get the word out about certain events – I know last year that was it not for a TV appearance for a biology expo that I was involved with, we would not have had such a successful turnout. Over the years they have been around helping out for local charity events as well – and their news personalities have always been great to deal with, always going above and beyond to make sure they have every detail. Readers, if you can attend their open houses tomorrow, please do. If not, please write Prime Minister Stephen Harper , the CRTC, and the Minister of Heritage, James Moore. Local stations are such an important part of Canadian television and they need to be saved!